Maps to point your genealogy research in the right direction. The Ports of immigration that welcomed our ancestors lined the entire US coastline. 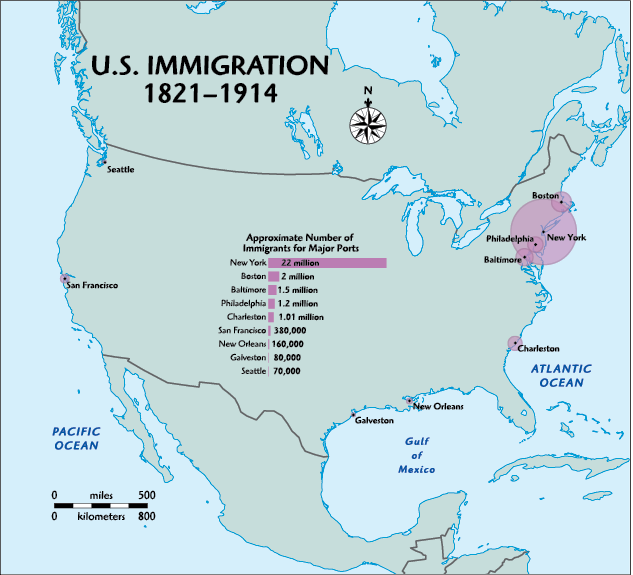 The vast majority of immigrants, though, arrived through the nine largest ports, as you can see on this map. During the years 1821 (a year after official passenger lists began) through 1914 (when quota laws slowed immigration), immigration into New York City eclipsed all other ports. Arrivals there totaled more than three times those at other ports combined. Europeans made up more than 30 million US arrivals from 1836 to 1914. Start tracking your immigrant ancestors with the websites listed on the Family Tree Magazine website.